Our 25th wedding anniversary, and Steve’s birthday: how to resist a recipe called verrines passion, passion verrines? I love making dainty desserts in glasses too. So I launched myself into Mercotte‘s complicated-looking recipe. Truth to tell, it wasn’t that difficult, and you can do much of it in advance. One word of warning: I messed up the tuiles by miscalculating the amount of butter. They ended up chewy instead of crisp, so I zapped them in the oven after cutting them out, hence they were dark brown instead of golden like Mercotte’s. They are delicious though; the lemon and cardamom work really well. I’ll definitely do them again, and get them right next time. I couldn’t get any passion fruit juice or pulp either, so I made do with mixed tropical fruit juice for the jelly. There are four elements: the tuiles, the caramelised almonds, the jelly and the cream. All can be made the day before, except perhaps the cream, and you can assemble them a few hours before the meal, then keep in the fridge. This serves two, but you’ll have some almonds and tuiles left over. Tant pis! Preheat the oven to 190C. Bring the sugar and water to the boil, stir in the almonds, then spread out on a non-stick baking tray and put in the oven for 8-10 minutes, till lightly caramelised. Leave to cool, making sure they aren’t stuck to each other or the baking sheet. Cream together squgar and butter, then beat in the egg whites in two batches, alternating with the flour. Scrape the seeds out of the vanilla pod over the bowl, add lemon zest and cardamom, stir in, then spread the mixture thinly onto a silicon-lined baking sheet. Cook at 180C for about 10 minutes, making sure they don’t burn. You need to cut them out while the mixture is still hot, so have a heart-shaped cutter ready, cut them out, and spread on a wire rack to cool. Soak the gelatine in cold water while you bring juices, sugar, and water to the boil. Boil for 1 minute, then remove from the heat, squeeze out the gelatine and stir in. Pour into glasses and leave in the fridge to set. Soak the gelatine, heat the fruit juice till just warm, and stir in the squeezed gelatine. Whisk together sugar and mascarpone and stir in the juice. Whip the cream till stiff and fold in. 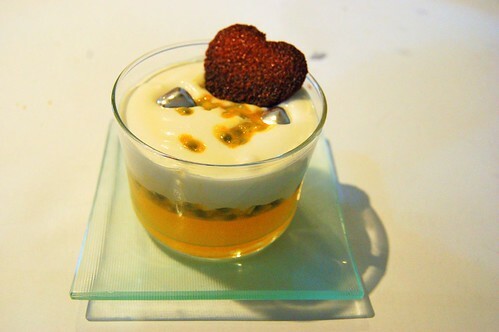 Halve the passion fruit and scrape seeds and pulp of half a fruit over each glass of jelly. Spoon over some cream, then sprinkle in some almonds, and add another layer of cream. Scrape the pulp and seeds of another half passion fruit over the top. Decorate with little silver hearts or berries, and a heart-shaped tuile. Serve with love.